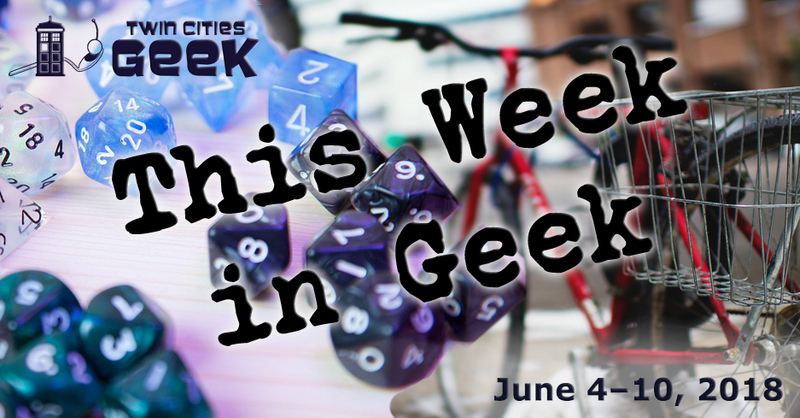 Welcome to This Week in Geek, your guide to events of interest to the Minnesota geek community for the week of Monday, June 4th to Sunday, June 10th. When: Monday, June 4th at 6:30 p.m. When: Tuesday, June 5th at 5:00 p.m.
Stranger things have happened, but when the Science Museum of Minnesota gained national attention due to a vintage Brontosaurus sweatshirt being featured in an episode of the Netflix series Stranger Things, the museum sold thousands of sweatshirts and used the money to fund outreach programs. This event celebrates that strange turn of events with the release of their new beer Thunder Lizard, a science van from the Science Museum of Minnesota with loads of cool activities, swag, and $1 off tap beer to Science Museum members. This is a family-friendly event, and activities are intended for folks of all ages. There will be a special performance from The Baldinovs. When: Tuesday, June 5th at 6:15 p.m.
Books & Bars is an “open public book club show” hosted and moderated by Minnesota Public Radio senior producer Jeff Kamin that provides attendees with “a unique atmosphere for a lively discussion of interesting authors, fun people, good food, and social lubrication.” The book being read and discussed this month is The Hate U Give by Angie Thomas, an award winning young-adult novel following the story of a woman drawn to activism after a police shooting of a friend. When: Tuesday, June 5th at 7:00 p.m. Enjoy a night of community and tea with Tea and Meeples, a weekly gathering of friendly geeks at Panda Castle in Richfield. This week, the group will gather round for a night of board games, and enjoy some veggie korma for dinner! When: Tuesday, June 5th at 7:30 p.m.
Come and experience YogaQuest, a blend of yoga and fanfiction storytelling led by certified yoga instructors. Experience a yoga workout experience and a story at the same time. The theme for this week is Ferris Bueller’s Day Off, so get ready to chill out, borrow your friend’s dad’s car, and enjoy life. This event costs $15. When: Wednesday, June 6th at 6:00 p.m.
Clockwerks Brewing, the place to be for geeky steampunk-themed decor and rotating craft beer in downtown Minneapolis, will be hosting a Magic: The Gathering booster draft. This event will be focused on the new Dominaria Planeswalker decks, which, per the event listing, are a great fit for first-time players. The entry fee is $15, and players will use three booster packs to form 40-card decks and compete for cards and goodies from Clockwerks. When: Wednesday, June 6th at 6:30 p.m.
Dan Gearino will be at Dreamhaven to promote his new book, Comic Shop: The Retail Mavericks Who Gave Us a New Geek Culture, in a place that inspired him to write it. This book looks at the history of comic-book shops, their challenges, and the way they helped bring geek culture to the mainstream. There’s also a local connection here, as Dreamhaven and its owner play an important role in this story. This event will include a discussion with the author as well as a signing. When: Thursday, June 7th at 7:00 p.m.
First Thursday Films at the Capri Theater—a screening and speaking series—will be showing Fruitvale Station part of Black Cinema: Under the Skin, a program of films by black filmmakers exploring black culture and experience. This month’s film is Ryan Coogler’s (more recently known for directing Creed and Black Panther) feature-directorial debut, a drama centered around a young father gunned down by BART officers on New Year’s Day in 2009. Tickets are $5. When: Friday, June 8th at 6:00 p.m.
Join Ghostbusters North for a kid-friendly celebration of all things Ghostbusters, featuring Ghostbusters pinball, photo ops, and more at the retro-tastic DeLeo Bros. Costumes are encouraged. When: Friday, June 8th at 6:30 p.m.
Tabletop-gaming geeks in the northwest reaches of the Twin Cities metro have a monthly home at Wright County Geeks Tabletop Gaming. This event is held at the Buffalo Community Center, and will play host to great tabletop role-playing games like Dungeons & Dragons and others. Come check it out if you’re curious about RPGs or are looking to make new gaming buddies. When: Friday, June 8th at 7:00 p.m. When: Friday, June 8th at 7:00 p.m., Saturday, June 9th at 1:30 p.m. and 7:00 p.m. Enjoy a screening of the cult classic The Princess Bride, and enhance the experience with a shadow-cast performance! This will be similar to the sort of play-by-play experience that often accompanies The Rocky Horror Picture Show, and includes callbacks, audience interaction, and props. Pre-sale tickets to this family-friendly event are $15 for general admission, and 8$ for economy. When: Friday, June 8th and Saturday, June 9th at 7:30 p.m., Sunday June 10th at 2:00 p.m.
Storytelling and sketch comedy come together to confront, mock, and dismantle racism, racists, and stereotypes in this exploration of the mixed-race experience. Inspired by the personal experiences of playwright Duck Washington, this event uses humor as a way to understand concepts with a degree of depth. Tickets are $25, with discounts available. This performance will continue through June, and is produced in collaboration with Fearless Comedy Productions. When: Friday, June 8th at 8:30 p.m. When: Friday, June 8th at 9:30 p.m.
Ladyfriend is a “three-human comedy group” known for improv, creating fun videos, and enjoying candy. Becky Wilkinson Hauser, Beth K. Gibbs, and Jen van Kaam will show you what new worlds can be built when three charming-weirdo BFFs share the stage, so prepare to be delighted. General-admission tickets are $10. When: Saturday, June 9th and Sunday June 10th at 9:00 a.m.
Support literary programming in the Twin Cities, and get your hands on a great selection of used books with the fourth annual Epic Used Booksale at Ancestry Books. In the past, this sale has raised funds to bring Joseph Rios, Zetta Elliott, and Alexis Pauline Gumbs to the Twin Cities for events. All books will be $5 and under, and the organizers of this event could use help with book donations, so if you have some old books that are taking up shelf space and need to be read by others, bring them in and help out. When: Saturday, June 9th at 12:00 p.m.
Come to your happy place with the help of nature’s goofy and joyous acrobats: goats! Enjoy a summer day at Insight with goats, three specialty casks of beer, and food from Black Market StP BBQ. An opportunity to hang out with goats in a cool local brewery doesn’t come around often, so don’t miss it. When: Saturday, June 9th at 12:01 p.m.
Come together with your fellow geeks for a day of food, fellowship, and fun under the sun! Geek Partnership Society has sponsored this event, and will be providing protein for grilling, buns, plates, and flatware, but encourages attendees to bring side dishes to share. Anyone interested in geeky activities is encouraged to join, as are members of Geek Partnership Society, their partners, family, and friends. There may also be activities involving flying objects and score keeping. When: Saturday, June 9th at 2:00 p.m.
Five authors will be at Barnes & Noble Roseville for a first-of-its-kind event focused on sci fi, fantasy, and the paranormal. The event will feature five authors—New York Times–bestselling fantasy author Steven Brust, convention regulars Christopher Schmitz and Jason Quill, paranormal investigator and author Adrian Lee, and K. Bird Lincoln—reading, signing, and answering questions. When: Satuday, June 9th at 3:00 p.m. The written word will be elevated and celebrated at this crawl through Uptown Minneapolis. Free events will be held at Bryant Lake Bowl, Magers & Quinn, and Trapeze Bubbles Bar at Barbette and will feature work from Write on Mamas, Autoptic, Fisher Cats, Magers & Quinn, Ryan Chapman, Button Poetry, The Loft, Coffee House Press, Graywolf Press, and Nicole Garneau. Find the Lit Crawl event for you with the event schedule. When: Saturday, June 9th at 7:00 p.m. Fans of dark electronic music will be in for a treat at this concert in Cedar Riverside, bringing Adoration Destroyed, Fires, Xentrifuge, and Souless Affection together. The bands featured on this lineup are inspired by dark electronic music from the past, new EDM-inspired production, retrofuturism, pop melodies, synthwave, industrial, noise, and more. Tickets are $12 in advance or $15 at the door. This 21+ event was brought together by Kilted Farmer Koncerts; see our recent article on their efforts to bring goth and industrial bands to the Twin Cities! Celebrate 50 years of the Electric Fetus with a night of music headlined by Real Estate. This local record store and Twin Cities institution continues to be really important as a way for music geeks to get curated suggestions for new bands, learn about shows, and generally connect with other music geeks. David Campbell will host this 18+ event, with music from Habibi, Flamin’ Oh’s, Last Import, and DJ Roy Freedom. Tickets are $20. When: Sunday, June 10th at 10:00 a.m. When: Sunday, June 10th at 12:00 p.m. When: Sunday, June 10th at 12:30 p.m. Gender Jam—a meetup group for trans, gender-nonconforming, questioning, and intersex youth—will be meeting up for an afternoon of community and fun. This week, Gender Jam will be taking a field trip to the Golden Valley Pride Festival to see how Golden Valley celebrates Pride! As always, bring your permission slip if you are under 18. When: Sunday June 10th at 7:00 p.m. Enjoy an evening of community movie magic under the stars! Movies start at dusk, and are free and open to the public. Bringing a blanket or lawn chair is recommended, and children under the age of 10 must be accompanied by an adult. Come to this event for a screening of geek favorite: Guardians of the Galaxy Vol. 2. Find other Movies in the Park listings here.